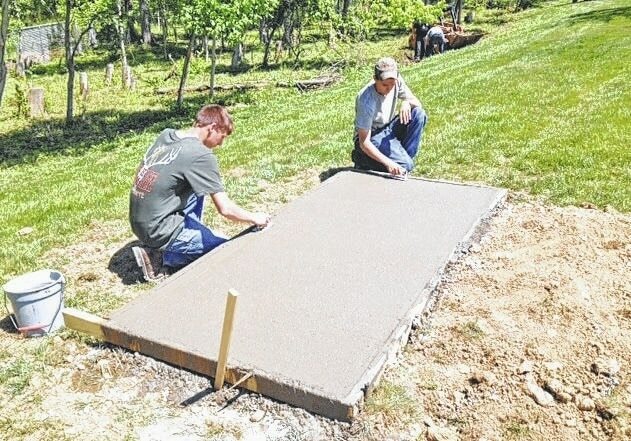 Laurel Oaks students Logan Murphy, left, of Leesburg and Mason Burchett of Hillsboro smooth out the slab for benches at the dog park. Both students also work in the masonry field and will return for their senior years at Laurel Oaks in the fall. Students from a variety of programs at the Laurel Oaks Career Campus pitched in before the last day of school this spring to help prepare old and new Wilmington City Parks for their busiest time of the year and also constructed a sitting wall at the unfinished Xidas Park in downtown Wilmington. Singer said that in May, juniors from industrial diesel mechanics, automotive technology-mechanics, masonry, welding and CareerX Labs, along with some of their instructors, worked on a multitude of projects with Wilmington City Parks Director Lori Williams and her staff. The students came from all of Laurel Oaks’ 10 feeder schools – Blanchester, Clinton-Massie, East Clinton, Leesburg Fairfield, Greenfield McClain, Hillsboro, Lynchburg-Clay, Miami Trace, Washington and Wilmington. Much of the work focused on getting the dog park ready for its recent opening. Xidas Park is under development at the corner of South South Street and West Sugartree Street. The Laurel Oaks students are done there, but eventually light posts will be added, along with a steel pergola and more landscaping, Williams said. Submitted by Dana Dunn of Ace Communication Enterprises.